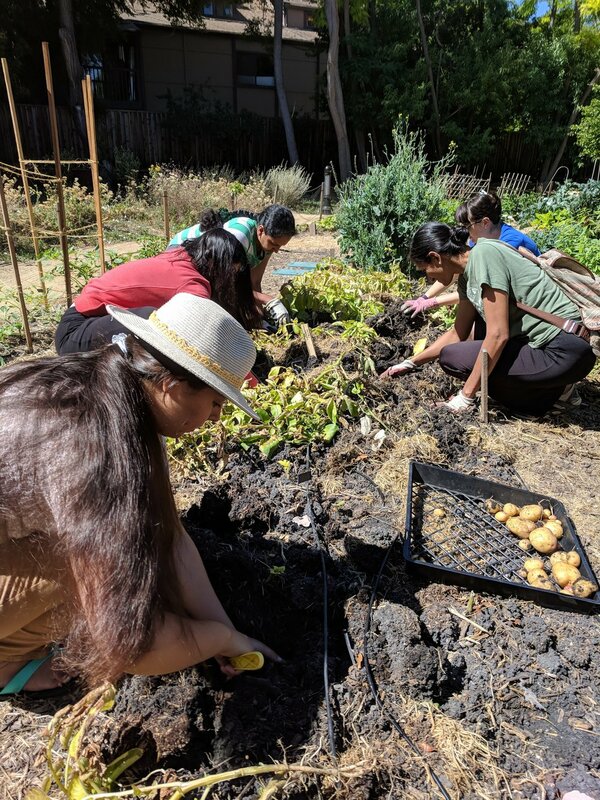 This past Wednesday, we harvested our third batch of potatoes. 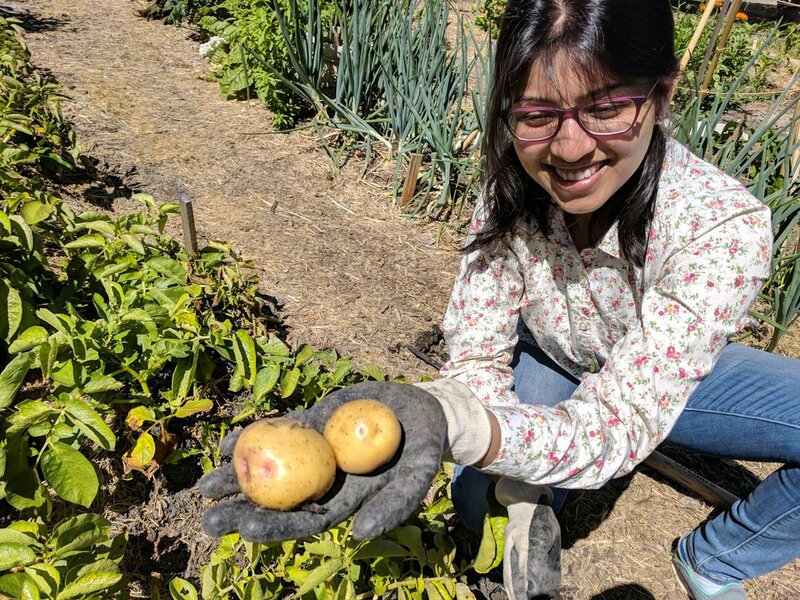 In February 2018, we planted Yukon Gold potatoes and Onion sets in the garden. They have been growing for a few months and are now pretty large and ready for harvest. 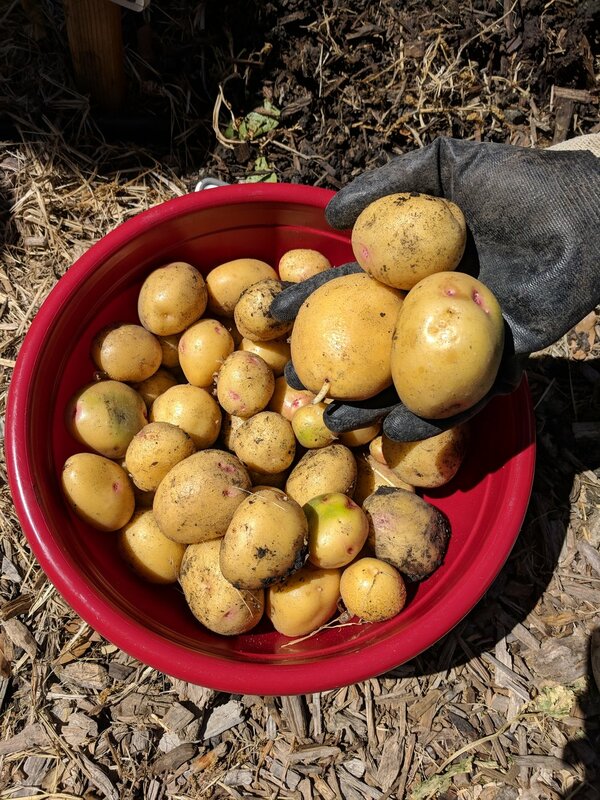 A few weeks back we harvested our first potatoes and posted on Facebook about what we found with pictures (www.facebook.com/soilandwatergarden). The onions became ready shortly after. We stopped watering them one month prior to harvesting and are getting a nice harvest of those too. Onions and potatoes make a perfect combination for so many recipes so we thought it was good time for a cooking demo day. Two of our gardeners, Archana and Shruti demonstrated recipes on-site at the garden. Shruti's recipe was a take on masala taro Punjabi style. Archana made saag aloo. Dulce shared a Mexican potato cake recipe. We had a nice time chatting and watching the cooks. 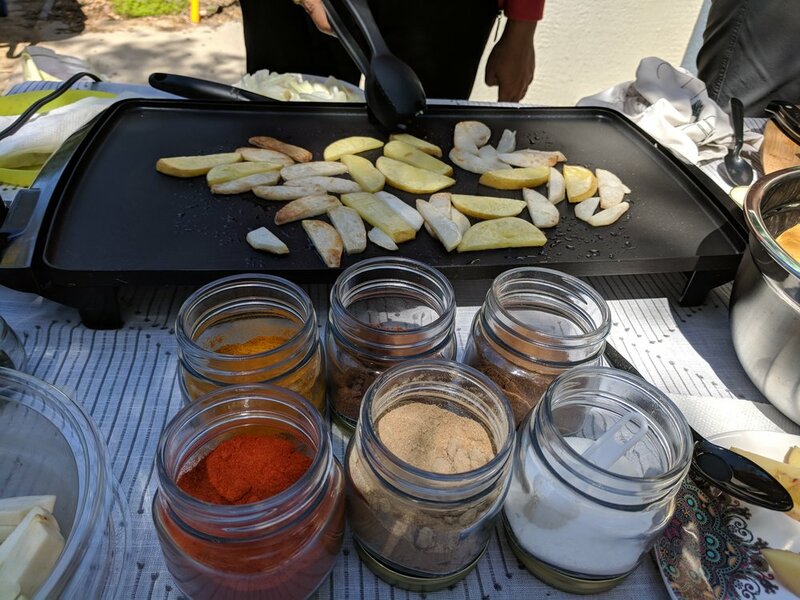 Unfortunately, the electrical had some trouble during our demo so we weren't able to finish the saag aloo for tasting but we enjoyed the masala potatoes/taro and Mexican potato cakes! 1) Peel taro root. Thinly slice potatoes and taro root. Put some olive oil on a griddle and pan fry the potatoes and taro. 2) When the taro root is almost cooked, add sliced onion and cook for 1 minute as the onion begins to soften. 3) Add masala: Chili powder(to taste), salt(to taste), turmeric(slightly less than salt), pomegranate powder(1.5 - 2 times salt), mango powder (1.5 - 2 times salt) and garam masala(about a third of the salt). Some extra oil might be required to ensure that the masala gets coated evenly. Mix thoroughly to ensure that all the slices are coated with the spices evenly and cook for about 2-3 minutes till the masala gets incorporated.